It’s the last day of 2018, and I thought I ought to get at least one post in during this calendar year. Although I’m tempted to write a long story about all of the joys and challenges (OK, mostly challenges) in life and business, I don’t think that would be especially cathartic, and anyway my to do list is longer than yours, so I need to get back to it. With luck, I might be able to polish off everything that absolutely must happen before the end of 2018, no matter what, within six weeks. Maybe eight. Through all the ups and downs in my life, I’ve noticed a recurring trend: that which is necessary somehow becomes possible. This coming year will be the biggest test of that concept yet, as some distinctly unprobable things have become necessary (where unprobable means even less probable than improbable, but just shy of impossible). I usually have to wait till the last minute (or, sometimes, a few days after the last minute) to find out how the unprobable becomes possible, which is pretty nerve-wracking. It’ll be…interesting. Because my circumstances are not conducive to any appreciable amount of blogging or social media involvement for the time being, those of you wanting to be better informed about my goings-on or (gasp!) interact with me personally are quite welcome to send me email, and I hope you will. And if you’d like to send me something for my birthday next week, I can always use a large box of money, or some black socks. Back in January I turned 50. I dyed my hair purple, threw a big party, and psyched myself up for the next half century (or as much of it as I’m privileged to experience). As one does upon reaching such milestones, I spent a lot of time reflecting on the past and pondering the future. I’d been growing increasingly interested in doing new things, making more of a contribution to the world, and avoiding the huge peaks and valleys of income that come from living off of book royalties and the occasional odd consulting gig. So I formed a plan that I intended to put into action over the course of 2017 that would accomplish all of the above. Well, life is funny. I can’t tell you how many times I imagined that things would go in a certain direction (personally or professionally), and spent months or years planning for a certain future, only to encounter some random thing at the last minute that took me down a completely different, unexpected, and (usually) delightful path. In fact, this has happened so consistently throughout my life that I should have anticipated that it would happen again right about now. Anyway, guess what? It happened again, in a pretty big way. I’ve now become the owner and publisher of Take Control Books. That is, my little company (alt concepts inc.) has acquired Take Control Books from TidBITS Publishing Inc.’s owners, Adam and Tonya Engst. In the process, I’ve upgraded my title from Author to Publisher, and I’ve embarked on a new career (even if, in some respects, it’s an expansion or continuation of my old career). None of this was even remotely part of my plan. I thought I’d be tapering off my involvement with Take Control and doing other stuff—more of certain activities I’m already doing, plus an entirely new project that I thought might really scratch my various itches. But I’d barely gotten underway with this ambitious scheme when Adam and Tonya said they were thinking of selling Take Control and asked if I might like to buy it. For starters, it’s not like I had a huge sum of cash in the bank that I could just hand over to purchase this business. That could have been a deal-breaker, but Adam and Tonya felt the advantages of having me as an owner (since I know the business intimately and could maintain continuity better than anyone else) were worth some inconvenience. So we developed a fairly elaborate payment scheme to ensure that all parties will have enough to live on. In fact, assuming our projections are at least in the ballpark, my total annual income should go up a bit, even after factoring in the cost of the business. It’s a pretty sweet arrangment. But there were other factors to consider. I didn’t exactly have loads of surplus time either, and becoming a publisher is going to require an immense amount of work. I think I know how I’m going to cope with that, but as any parent can tell you, the first few months (or longer) with a new kid mean a lot of sleepless nights. So, I’ve stocked up on coffee. I am nervous about how work will cut into the time available for my kids (especially the little one, who needs an extraordinary amount of attention because he’s autistic), and vice versa. That’s going to be a challenge. And I’ve had to accept that some of my erstwhile goals and plans will have to be back-burnered for now, which makes me a little bit sad, but not too sad, because running Take Control is less risky and more likely to produce stable income in the near future than my speculative projects. Besides, my new work is interesting enough and challenging enough that I probably won’t be pining for something else before I have the resources to make it happen. One curious aspect of running Take Control is that it’s in my best interest to keep writing books, even as I’m publishing other people’s books. I won’t have as much time to write as I did before, and I still do want to reduce my frantic pace (an average of four books a year for 14 years, geez), but the math works out better, at least for the first stretch of time, if I write at least a couple of new books per year and keep most of my older ones up to date. In that respect, it feels a bit like I’m adding a second full-time job, but again, I have plenty of coffee. Fortunately, I won’t be doing this alone. My wife, Morgen, was already an employee of alt concepts inc., but she’s upgrading her title as well, to Director of Marketing and Publicity. Her to do list is nearly as long as mine, and I think our abilities will complement each others’ nicely. In addition, TidBITS will provide customer service and other kinds of support on a contract basis, and Tonya will continue editing some of our books. And of course our brilliant freelance authors and editors will keep doing their thing. So I think we’ll be in good shape. This is, without question, the biggest thing that has ever happened in my career. It’s exciting and scary. Wish me luck! The first Mac backup software I encountered, way back in the early 1990s (so, System 6 era) was a program called Redux. That’s a wonderful word, redux—it’s an adjective meaning “brought back” or “revived.” So it’s appropriate for the name of a backup app, and also appropriate to describe my latest project, a book called Backing Up Your Mac: A Joe On Tech Guide. I’ve been writing about Mac backups for more than 10 years, and it’s one of my favorite tech topics. My Take Control books on backups have gone through a number of titles and editions, but the most recent incarnation, Take Control of Backing Up Your Mac, was last updated in 2013, and was definitely showing its age. Unfortunately, there was no room in the Take Control publishing schedule to update it this year. So I offered to “adopt” the book and revive it myself. I hired my own editor, tech reviewer, and so on, updated the book thoroughly, and released it with a new title. 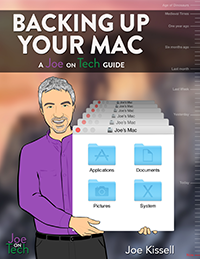 The result is Backing Up Your Mac: A Joe On Tech Guide, the first in what I hope will be a long and successful series of Joe On Tech books. I’m super excited about this new book, and I hope you’ll check it out! You can read more about the project in my Joe On Tech post Protect Your Mac’s Data with Backing Up Your Mac: A Joe On Tech Guide.